The Royal Marines Volunteer Cadet Corps (RMVCC) is primarily geared towards field-based activities and training although some of our activities overlap with our Royal Naval Cadets counterparts. Our traditional motto is ‘Be Worthy’, an ethos to which we expect all of our cadets to aspire. Our Royal Marines Cadets wear both the ceremonial ‘Blues’ uniform of the Royal Marines as well as the camouflage ‘Combats’ uniform. Also, Royal Marines Cadets are privileged to have the title “Her Majesty’s”, bestowed upon all Royal Marines Cadets (VCC, SCC and CCF) during the Royal Marines 350th Anniversary Parade at Buckingham Palace in July 2014. The first Royal Marines Cadets were formed in 1901 at what was then the Royal Marines Artillery barracks in Portsmouth (now home to the Corps Museum), and were called the Royal Marines Artillery Cadet Corps. Soon expanding to Chatham, Plymouth, Deal and Lympstone, the title changed to Royal Marines Volunteer Cadet Corps when we joined with our Royal Naval Cadet colleagues in the 1910s. Portsmouth (based in HMS Excellent). Plymouth (based in RM Stonehouse). Lympstone (based in Commando Training Centre). …and we are seeking recruits and adult volunteers for all units , join us and see if you can Meet the Challenge. Boys and girls can join the Royal Marines Cadets between the ages of 9 and 17, and then serve until their 18th birthday. Having joined they undergo 4 to 5 months’ basic training as a recruit and then ‘pass out’ during a ceremonial parade in front of family and friends having been inspected by a senior officer. Once passed out they can join the Band (if their unit has one) or become a General Duties cadet. See Our Activities for more information. 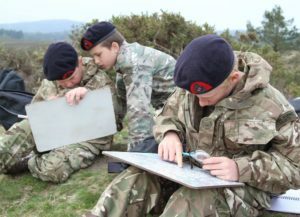 In all of our activities, parental support is crucial in assisting the cadets in getting the best out of what we offer. That may be help with preparing uniforms (although of course we expect cadets to polish their own boots ) and being a ‘taxi-service’ to and from our activities (although we do provide transport for most of our out-of-area activities). Our joining fee is usually £80 which, whilst sounding a lot, is a lot less than the value of uniform and equipment that each cadet will be issued. Once joined, each cadet needs to pay a £5 monthly subscription and there may be charges for activities like annual camps. Most of our other activities like weekend exercises and attending competitions are free of charge. We provide all basic items of uniform (except boots which for health reasons have to be provided by individuals) and personal equipment although some cadets buy additional items so they always have spares. We are always pleased to accept enquiries, whether its about joining as a cadet, joining our staff, booking one of our Display Teams, or just to find out more about us. Contact your nearest RMVCC Division today to see if you could ‘Be Worthy’ of being one of Her Majesty’s Royal Marines Cadets with the Volunteer Cadet Corps.